Your (obviously sustainable) Turkey Day is all tucked into tupperware and the happy tummies of your friends and family. Holiday music has already been on the radio for a month, and the gaudy red and green splashed merchandise has gravitated to the front of the store. Now, I suppose, is the time to start thinking about presents. May I encourage you to make it a DIY Christmas? In these hilarious accounts of just such, one my my favorite writers (Elisabeth Kwak-Hefferan) delves into the practice with her entire family. But if you can’t encourage your whole family to switch, you can use tips like these to make your holidays chock-full of some crafty goodness. Making your own gift, rather than buying from a store, usually involves less materials and therefore less waste. Homemade jelly packaged in a reusable glass jar, a hand-sewn throw pillow or even a framed picture decorated by you are all simple and thoughtful gifts. Some would even say they’re more authentic. But if that’s not an option for you, at least consider the wrapping paper. According to Stanford, if every American family wrapped just 3 presents in re-used materials, it would save enough paper to cover 45,000 football fields! This is a tremendous savings to both you and the planet. This Treehugger piece is a great space for inspiration for some excellent DIY wrappings. Here’s a little more inspiration below, but please check out the Treehugger piece for even more! Has your bin been a little empty after reading that list of things you couldn’t recycle? Never fear! There’s plenty more to toss in those orange and blue boxes. As a follow-up to last week’s post, here are some unusual items that actually CAN be recycled! Once again, courtesy to Mother Nature Network for the list. Also again, for any questions about where to locally donate or recycle some of these materials, check out the list from the city of Gainesville. They’ve got you covered. “Americans send more than 15 million bicycles out to pasture every year. But rather than throwing them in the dump, you can give your old two-wheelers a second life by donating them to Bikes of the World, which collects, refurbishes and donates bikes to lower-income people and select institutions in developing countries.” Or, if you’re at UF, you can leave your bike on campus over break, and the bike will be removed and added to a collection. However, that’s not necessarily the best way to go about it. Before you toss that hairspray can in the recycling bin, take a look at this list. There are a ton of things that are unable to be recycled, from coffee mugs to napkins to batteries. Things that you’d think belong in those orange blue boxes just don’t. Most of these items have a designated location for someone to collect them. So check out this super handy recycling guide from the city of Gainesville. It has a huge list of items, complete with all the information to make recycling everything a breeze. Courtesy of Mother Nature Network, here are some items that you (shockingly) can’t recycle! So think twice before you chuck any of these into your bins. Batteries: These are generally handled separately from both regular trash and curbside recycling. Brightly dyed paper: Strong paper dyes work just like that red sock in your white laundry. Ceramics and pottery: This includes things such as coffee mugs. Household glass: Window panes, mirrors, light bulbs and tableware are impractical to recycle. Bottles and jars are usually fine. Compact fluorescent lightbulbs (CFLs) are recyclable, but contain a small amount of mercury and shouldn’t be treated as common household bulbs. For ideas on how to handle them, see 5 ways to dispose of old CFLs. Juice boxes and other coated cardboard drink containers. Some manufacturers have begun producing recyclable containers. These will be specially marked. The rest are not suitable for reprocessing. Napkins and paper towels: Discouraged because of what they may have absorbed. Consider composting. Pizza boxes: Too much grease. While some compost enthusiasts steer clear of adding pizza box cardboard to their pile, others report no problems. It’s that or the trash. Plastic bags and plastic wrap: If possible, clean and reuse the bags. Make sure neither gets into the environment. Plastic-coated boxes, plastic food boxes, or plastic without recycling marks: Dispose of safely. Plastic screw-on tops: Dispose separately from recyclable plastic bottles. Remember that smaller caps are a choking hazard. Tyvek shipping envelopes: These are the kind used by the post office and overnight delivery companies. Wet paper: In general, recyclers take a pass on paper items that have been exposed to water. The fibers may be damaged, and there are contamination risks. For your (somewhat) long video of the week, check out this 13-minute talk by Steve Howard, the chief sustainability officer at IKEA. I won’t go into more detail, but take a listen. 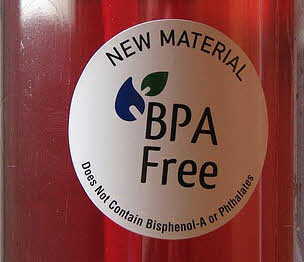 Bisephenol A (or BPA) is an epoxy used to make clear, hard plastics. You see this kind of plastic every single day, whether it be in the grocery store, in vending machines or in the tupperware you use to store your food. It’s often used as coating inside plastic bottles or tin cans. At high-dosage levels, BPAs have hormone like properties. They are endocrine disruptors, and some studies show that they can cause possible negative effects in animals and fetuses, causing birth defects. Some of these effects are stronger when BPA filled plastic is chipped, broken or heated. Most world governments, including the US, Australia and the EU, have declared that BPAs are mostly safe for human consumption at low levels. However, several countries (even the US) have banned BPA use in products such as baby bottles. But there are many, many studies supporting both sides of the debate, with the main issue being that studies showing harmful effects of BPAs (even at low does) are hard to reproduce. Scientific American covers the controversy surrounding the issue pretty well. Wherever you fall on the argument, limiting exposure to possibly toxic chemicals is just another reason to use less plastic. But a life without plastic can be pretty tough. The stuff is ubiquitous! What’s a green-minded consumer to do? The best way is the simplest, use alternatives. Whenever possible, refuse plastic, single-use, disposable items. Choose glass, aluminum or paper over plastic whenever you can. Why? Because when items like these are recycled, they can be turned into new and equally useable products. Plastic, not so much. Keeping plastic out of the waste stream is just one more way to make a smaller impact on the Earth, and if it means being a little healthier in the process, even better! Your ecological footprint is a measure of how much land it would take to produce the resources necessary to sustain your lifestyle. Maybe you’ve started to dip your toe into the waters of the sustainability movement, and you’ve heard some chatter about footprints. Carbon footprints, global footprints, ecological footprints — any kind of footprint, really. “What gives?” You may ask. Well, I’ll tell you. The most accepted”footprint” these days is an ecological footprint. An ecological footprint is “a measure of how much biologically productive land and water area a human population requires to produce the resources it consumes and to absorb its wastes, using prevailing technology”. It’s also another way of expressing carrying capacity, which is the total population a certain set of resource sources and sinks can sustain and absorb. The USA has the largest carbon footprint of any nation on Earth, which means that even though we may not have the largest percentage of the global population, we use the largest percentage of resources. When you fill out a footprint calculator, it asks about certain behaviors, including how much you spend on your electricity bill, how often you eat meat and how often you use fossil fuels. It takes these behaviors and gauges how much land is necessary to produce all the food, fuel and power to keep you at your standard of living. It then tells you how many Earths it would take to produce all the resources needed if everyone on the planet lived the exact same way you did. When you fill out this quiz, you may be alarmed to find that your footprint would take 3, 4 or even 7 Earths to sustain over the long run. While you can lower this through making more more sustainable life choices (i.e. conserving water, eating less meat or using alternative transportation) there is a certain amount of this calculation that is immobile the second you click “USA” as your home nation. The US uses resources to produce crops, maintain an army and basically do things every government does. We just happen to do it more wastefully than most. FInding out your personal ecological footprint is a great way to put your lifestyle choices in perspective, and to see what kind of an impact your lifestyle and choices make. Interested in finding out how you score? Check out this handy calculator to find out for yourself. If you can take five minutes out of your day to watch a simple TED talk about how to be more sustainable, then this is the blog for you! Green Gator Girl is a resource for busy people who want to learn more about how to lessen their impact on the planet. It’s sustainability in simple, relatable posts. Changing the planet is easy, if everyone works together and makes simple, conscious choices every day. To find more information, check back through the archives. Don’t forget to subscribe for weekly tips on how to go green and stay that way. The other day, I had a revelation that changed the way I’ve always thought about sustainability. And to think, it started out like a thousand other totally mundane conversations. You know the drill. Your parents drag you to a social event and ditch you, leaving you to answer the same question to the same smiling, polite and utterly unmemorable adults ad nauseum. “How’s college?” Yikes. I was thrown. I’d grown up in such a sheltered bubble that the idea of someone who had no idea what sustainability was seemed unfathomable. But I was also thrilled. Here’s my chance! I get to explain something so important, so overwhelming linked to our daily lives, to someone for whom the concept had never even registered. It also sprang to mind that trying to be as politically neutral as possibly would probably help my case as well. So, drawing on my best journalist skills, I gave him as unbiased and simple an answer as I could muster. Sustainability, I said, is a big word for a simple concept. There are a finite number of resources in this world, and sustainability teaches you how to be the most economic with what you’ve got. It’s not abut politics, it’s about people, and making sure that there’s enough energy and resources to sustain everyone. It’s about being efficient with your materials, and in the long run you usually end up saving some money and the environment as well. Family friend nodded and smiled. But not the usual, vapid reaction you’d expect, he actually lit up and showed interest. And that’s the story of how I ended up talking to a 50-something lawyer about sustainability for half an hour at an otherwise dull event. Sustainability isn’t just something that you study in class and talk about with other sustainability majors. It’s an intrinsic facet of our lives that is interdisciplinary. The knowledge you learn applies to much more than just the examples you cover in class, it applies to every part of the world around you. If people had talked about sustainability more, shared it with everyone they met, then there would be a greater awareness of the subject, one that isn’t linked to politics or politicians. I encourage everyone to come up with their own “sustainability elevator speech” for those occasions when you talk about it with someone outside of the college. I encourage people to start talking about it with someone outside the college. You’re learning about it for a reason, so why not start applying it to your life now? Here’s another, more professional explanation, courtesy of the EPA, that might give you a little inspiration. “Sustainability is based on a simple principle: Everything that we need for our survival and well-being depends, either directly or indirectly, on our natural environment. Sustainability creates and maintains the conditions under which humans and nature can exist in productive harmony, that permit fulfilling the social, economic and other requirements of present and future generations.